An important aspect of growing up is learning manners and how to behave acceptably in different places and situations. I remember getting table manners drilled into me at a very early age. My parents had a very busy social life in their church community, and the last thing my mom wanted was to be embarrassed by a five-year-old with poor table manners. In the paragraph above, I used a few words that have acquired new meanings during the past few years: social, community and etiquette. “Social” doesn’t only mean going out or meeting with friends any more. It also refers to a form of online connection. “Community” is no longer just the place where we live or grow up in – it’s also a group of people, with the same interest or objective, who meet in cyberspace. And etiquette is no longer only what you do at the table or how to behave in public – it’s also how you behave when using any internet platform. 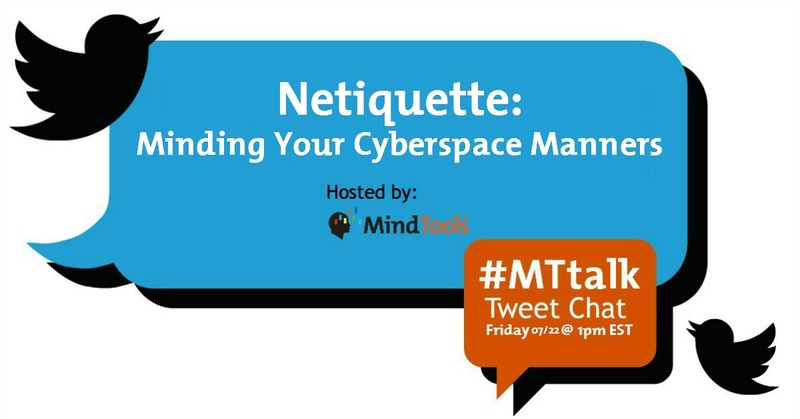 During our #MTtalk Twitter chat on Friday (July 22), we asked participants questions about “n-etiquette” and minding your cyberspace manners. @ShereesePubHlth: Automated DMs. The way some people use them have to be counterintuitive to the success of their brand. @JOmutanyi A1: Sarcasm – I don’t like it being in my space. @hopegovind: It gives me a lot of opportunity to learn things, connect with people. @Yolande_MT: I like #socialmedia and #email because it’s now, immediate, current. And I can switch it off when I want to. Question 3: Why do you think some people feel it’s in order to be rude or bully others online? @waltruistic: You bully offline, you bully online. That’s what blocking is for. @SayItForwardNow: They do not need to see someone’s immediate reaction to their rudeness, or see how it hurts. Question 4: How do you deal with poor n-etiquette when you experience it? @TwisterKW: Block. Ignore. Etc. Limit negativity where I can. Healthy debate is not same as pure negativity. @MicheleDD_MT: Depends on the nature of the offense. I try to educate, if it is possible and the context is appropriate. Question 5: Have you ever regretted your own behavior online and, if so, why? @SayItForwardNow: I have not regretted my behavior, but have sometimes regretted replying too quickly & without thinking. @SistadaHealer: I responded very emotionally in reaction to an incident in the news, I felt I should have kept my feelings to myself. Question 6: When would you not use social media? Why? @NootsCaboots: When I feel like venting. It’s always better to talk it through with someone first. @Midgie_MT: Would not use SM to deliver bad news. This is best done in person and in private. And, according to @Dwyka_Consult, a glass of wine and social media don’t necessarily mix well. Question 7: How can the use of internet platforms influence work/business relationships? @Singh_Vandana: One can use it as an advantage to learn, share and grow. Great opportunity to connect & build relationships beyond work. @risktakermdu: I have met good people on social media for business growth/advice. Just be careful because there are vultures out there too. Question 8: What issues can arise when personal and business mix online – and is it possible to separate them anyway? @AKKerani: Brands are becoming more personal because they know customers want to relate. Keep some boundaries while being candid. @waltruistic: When you’ve got integrity you can mix biz with personal SM. Question 9: What norms are important to respect when using any web-based communication medium? @ZalkaB :Written content can have a different meaning. Choose your words carefully, be mindful of the intent of your message, take time to understand HOW it reads and be mindful of cultural differences. Some more great advice came from @jprofNB: Before sending a message, ask yourself: would I be able to send this to my mom? Question 10: What advice can you give to those who are new on social media? @amypen64: People are new to social media? @Dwyka_Consult: Don’t share your life’s woes with everybody. Tomorrow when things look better, others still associate you with drama. One of your company’s star employees has been caught committing fraud. When you hear the news, you’re in shock. If you’ve ever wondered why good employees go bad, you shouldn’t miss our next #MTtalk Twitter chat. The topic is “Why Good Employees Go Bad,” and, as always, it will take place at 1 p.m. EST (6 p.m. BST). We’d love you to join us on Twitter to share your thoughts and ideas. To participate in the chat, type #MTtalk in the Twitter search function. Then, click on “All Tweets” and you’ll be able to follow the live chat feed. To join the conversation, simply include #MTtalk in your tweet and it will show up in the chat feed.